I just built this from the git clone, but I still have no temp and cpu freq values, what am I missing here? @dogbert2 I noticed in the README.md file that @LeeAdama says to clone the lepotato branch. Is it possible that you built from the master branch? 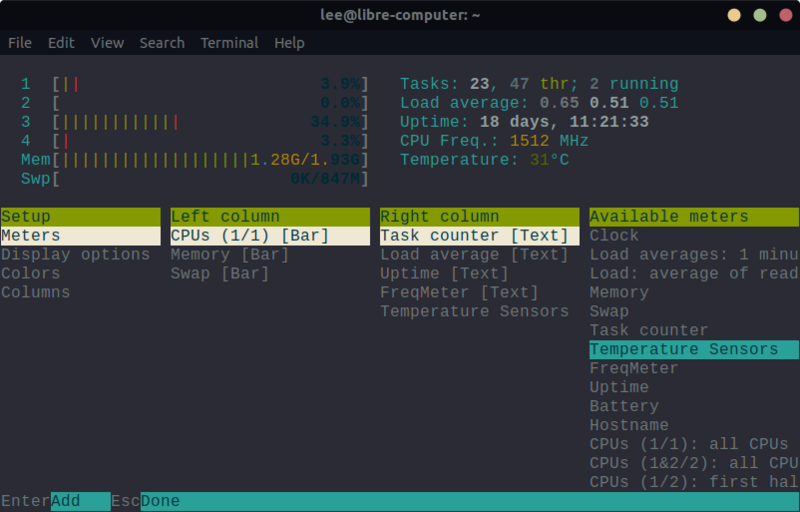 Probably should have mentioned that after you build it you have to add the temperature and frequency meters via the usual method built into htop. I.E. by pressing F2 and then choosing the meter you want to add. Also, make sure you are running the version of htop that you just built and not the version that came with your distro. That's correct. The master branch is for the raspberry pi.